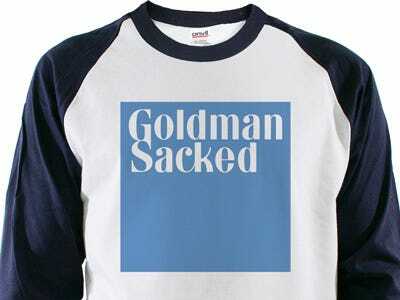 Goldman Sachs is getting hit left and right by ridiculous lawsuits, but this one takes the cake. So Jerome Goodman went to Goldman Sachs for investment advice in 2004, when he had $12 million invested in Bernie Madoff’s fund. Goldman’s advice, according the lawsuit: Remove $5 million of the $12 million from the Madoff Fund and invest it in a Goldman Sachs hedge fund. Goodman didn’t. He ignored their advice and kept all $12 million invested in Madoff. Instead of stomaching the error, he’s blaming Goldman for not trying harder to make him switch out the $5 million. He claims that because Goldman didn’t tell him otherwise, his (mis)understanding remained that Madoff and Goldman Sachs funds had the same apparent risk level. So he thought Goldman was just being selfish and kept his money with Madoff. Then years later, Madoff’s fund was exposed as a Ponzi scheme and Goodman lost everything. Presumably, when he found out that Goldman had put what the lawsuit says was “an internal ban on investment in the Madoff fund in or around 1999,” he was pissed. So he is suing Goldman for not telling him about it.